The HIPAAT logo reflects our patient-centered focus. Our software enables individuals to determine who may access their personal/ protected health information (PHI), what PHI may be accessed, when it may be accessed and under what circumstances. Although health information privacy is important, patient care is critical – so we enable healthcare providers to have override or ‘break-the-glass’ access to restricted PHI where appropriate or required by law. Auditing is required to ensure patient privacy. Our software generates an audit trail for all access – and attempted access – to PHI. We’re a healthcare software solution provider. We started our company back in 2002 in response to a growing need in electronic health information exchange: individuals’ privacy. We provide consent management and auditing solutions to enable health information privacy wherever the data is shared: between healthcare providers, organizations, regions and nationwide – ever mindful of the balance between privacy and clinical access to health information. Learn more. 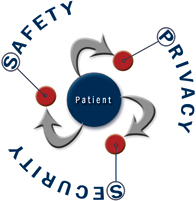 To empower patients and enable providers with innovative healthcare IT privacy and security solutions that enhance patient safety. The name HIPAAT (pronounced “hip-at”) is an acronym originally based on the U.S. Health Insurance Portability and Accountability Act (HIPAA). Standing for Health Information Protection and Associated Technologies, the HIPAAT name stands for our unchanging purpose – to protect health information – and the adaptable nature of our solutions.